My mother is a retired public school teacher. For the first part of her career, she taught Adult Education, which was just a new term for Home Economics. Each semester a new group of students would enter her class to learn how to cook, sew, do laundry, and other “life skills.” The school system realized early on that students weren’t learning basic skills at home anymore. As homeschool families, we have the unique ability to combine the modern educational philosophies and technology with the “old-fashioned” home living experiences. Homeschooling in the kitchen doesn’t have to be hard or frustrating, but often it is. As homeschool parents, we often try to make each experience “educational,” and we lose sight of our end goal. In this case, our ultimate goal is to teach our children life skills (how not to starve) with the added bonus of a little math and science thrown in for good measure. But, most importantly, we are making memories – moments our kids will look back on and remember when they are preparing their favorite meal. 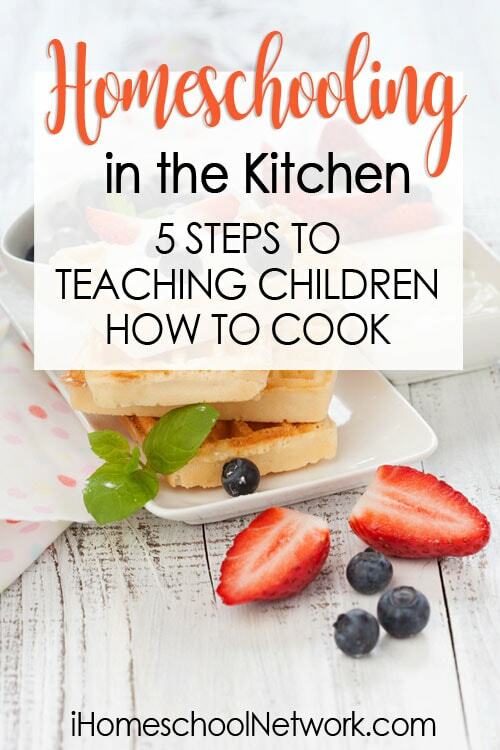 Follow these five simple steps to start teaching your children to cook and give them memories to cherish. My youngest loves spaghetti with meat sauce, so this was a natural first cooking lesson. She desperately wanted to feel like she was independent and could help cook dinner. So, I pulled out a jar of store bought sauce (not grandma’s 6-hour recipe), taught her how to brown the meat, and add the sauce. She also learned how to boil water and make the noodles. This straightforward experience gave her an incredible boost in confidence. It gave her a tiny bit of independence. Now, she can cook her favorite meal. As she has become more confident, we’ve added additional ingredients to fill out her spaghetti dinner menu. Children with small hands can sometimes find it difficult to hold adult-sized utensils. Find some simple tools that are designed for smaller hands. My kids love that they have their own tools that don’t belong to their siblings or parents. We found utensils in colors they liked so that they could feel special. When teaching your children the basics of cooking, you might want to skip over things like knife skills or using the gas stove. But, I urge you not to do that. These are skills that are important for kids to learn. When a child does not know proper knife skills, they will attempt to cut something and injure themselves. It’s important for them to learn the proper way to hold a knife and how to cut a vegetable without slicing their fingers. Many parents think they should put this lesson off until the children are teens, but the truth is that many children will use a knife when their parents aren’t supervising them. Without this basic lesson, the outcome can be dangerous (as I well know from my visit to the ER in my younger years). Make sure to teach all the skills that are appropriate for your child. Don’t try to teach your nine-year-old how to grill a steak in their first cooking lesson. Start simple. One of the easiest ways to start is with a boxed cake mix. The directions are easy to follow, and they are actually pretty good. If you want to make it taste a little more like a “scratch cake,” then doctor it up. Just substitute butter for oil and milk for water. People are amazed at the difference these simple changes make. Look up recipes that can be easily modified for children. We had a blast making Grandma’s vegetable soup. The kids were able to add their favorite ingredients, and they loved all the chopping. This is one of the hardest steps for me as a baker. My kids always want to help me bake and decorate cakes. I have to let go of my ideas of perfection and remember that they are young minds full of enthusiasm. They may not remember all the ingredients to Grandma’s chocolate cake, but they will remember their experiences with me in the kitchen. I want them to remember these as pleasant and happy experiences. And that means I have to be the one who leads us in a positive direction. Don’t let frustration or fear keep you from enjoying time with your kids. Have fun, get a little messy and make memories. Wonderful tips and I appreciate you sharing them with us because I can’t wait to share this article with my family.